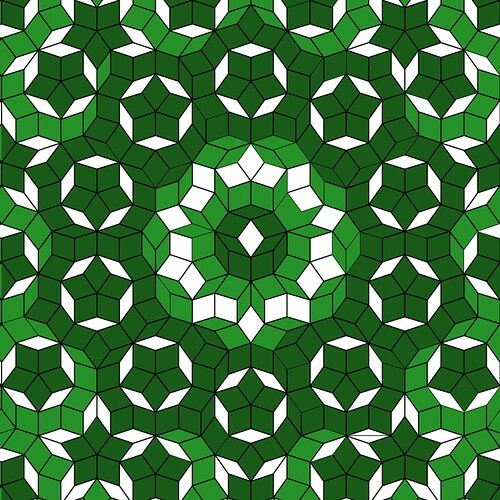 I've been more than a little obsessed with tilings ever since Jacob pointed them out to me a few months ago, and I've been quietly storing up tilings I think would make great quilts. At first, I asked myself why other quilters hadn't tackled these visually stunning images for quilt purposes, but eventually it sunk in -- because they're hard. They're demanding. Their continual broken and rebroken lines mean you never get the luxury of straight, long seams or 90° angles. 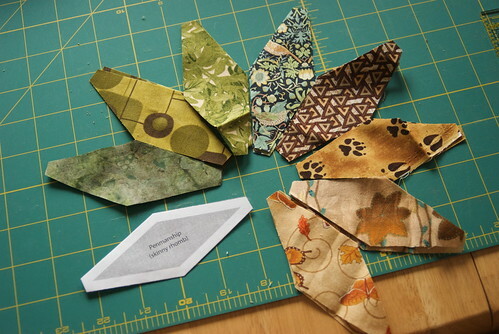 They require piecing odd and funky angles on small pieces over, and over, and over again. Because I am an idiot, this did not deter me one bit. Tiny, fiddly seams? We've got that. I laid them out and, over the course of a three-day weekend, got to work. One seam, one funky angle at a time, I got to work. 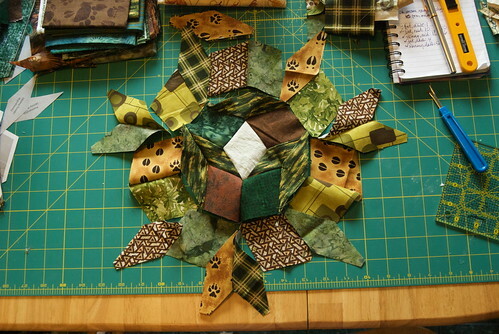 I pulled entirely from fabrics in the stash, most of them gifts from friends, and decided to try a new color scheme for me - muted, woodsy tones - quite a change from the intense jewel tones I love so much. If one ring rules them all, what about three? At first glance you see stars and circles. It doesn't even register on you that the entire design is based on fives instead of an even number. Does it really, at first glance, look like a layout that was the talk of the mathematical community when it was published? No? I didn't think so. It looks comforting, earthy. Like a star quilt, or a ring quilt, that your grandmother might make. It only has left-right symmetry. Draw a vertical line down the center of the quilt, and you'll see the reflection symmetry. But that's it. Even better: it's done with only two tiles. By this point, I was growing more confident. 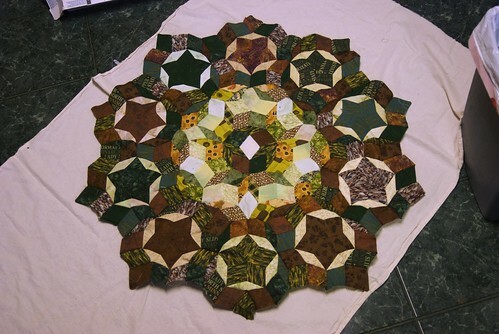 I had a better idea of how carefully to handle the thin pieces in orer not to fray them, and I could see that once I got the next row of dark ringed stars attached, the overall pattern of the quilt would be unmistakable. Still, it took seeing the first ringed star emerge from the pattern pieces -- those instantly recognizable mathematical bits known as Penrose stars -- before I believed that I really and truly had the chops to do this quilt. I need a better photo than this one but can't get it without sunlight; I am, however, too impatient to wait until morning to make this post with a better photo. I put the finished medallion down on the floor and photographed it immediately because I had to show it, I had to show it, I HAD to -- I wanted people to see what I'd been obsessing over and researching. 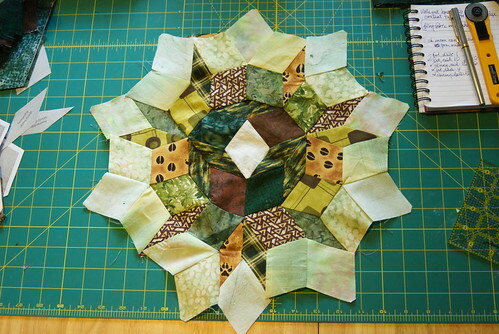 I still have to add the backing, but this medallion -- a Penrose cartwheel -- is emphatically the star of the show. 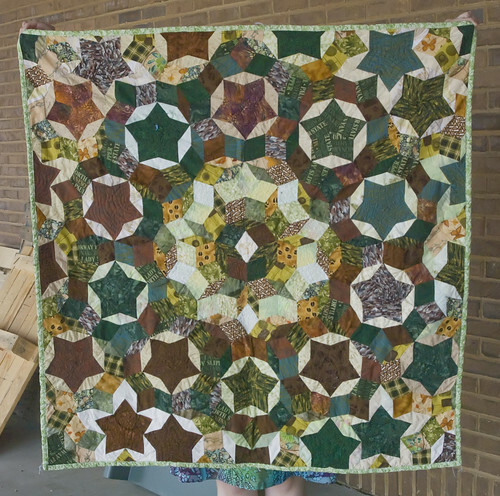 I know of a couple of small-scale Penrose quilts in existence, but I believe both were either 'sun' or 'star' configurations, and not the cartwheel. I'll slow down my frenetic sewing pace now that I've proven the design works. There's not a lot left to do at this point, though. I don't quite know how to quilt it yet, but I'll figure something out. Oh, and the name? 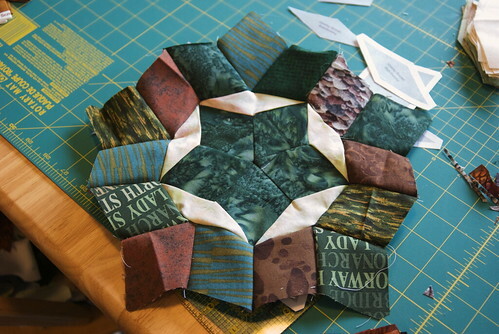 I like the idea of using names that start with 'pen-' for the Penrose quilts. It's a nice double reference to Penrose, the Western discoverer** of the tiling, as well as the prefix penta-, for 'five.' So a warmup Penrose all but has to be called "Penmanship," as in "practice your." I'm getting better. The perfectionist in me still twitches at some of the joins -- there are places where it could be smoother or cleaner or JUST ONE STITCH TO THE LEFT AAAAGGGH. 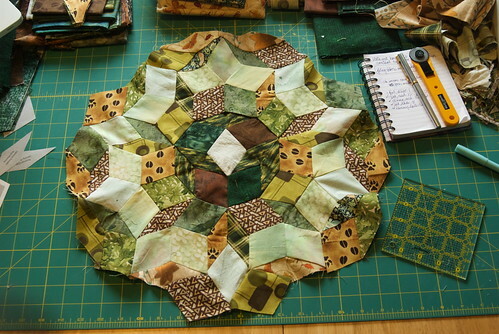 I think eventually I'll work up the bravery to enter a quilt, but I'm just not sure I'm ready yet. I'm trying to nudge my skills upward. This quilt is practice for Pentatonic (http://domesticat.net/quilts/pentatonic) and after Pentatonic will come the madness that is Seven Brides For Seven Brothers (http://domesticat.net/quilts/seven-brides-seven-brothers). 7B47B will probably make me crazy. If I survive it, I think it's a competition quilt. Until then it is my "what was I thinking?" quilt. I find it super funny now, after the fact, that I had managed to make my previous comment on this post in particular. Moses is right. I had no idea. No idea at all. I am truly in shock and awe that this was for me, and that in person it is far far far more perfect and beautiful than pictures could ever say. I will be taking pictures and putting them up (I'll link you) And I don't think I'll ever forget your gracious kindness to me as a friend, whom now I intend to ensure I have more solid contact with. Yep, when you commented on it both here and on flickr, it was hard to suppress a grin or two. I've been waiting very impatiently for the pesky thing to get through customs! Luckily I'd shipped a book across the US/Canada border to Alice and Brad a few months back, so I had some idea of how long a parcel would take to get across the border. I guess that means I can edit this entry to say who it was for, now!